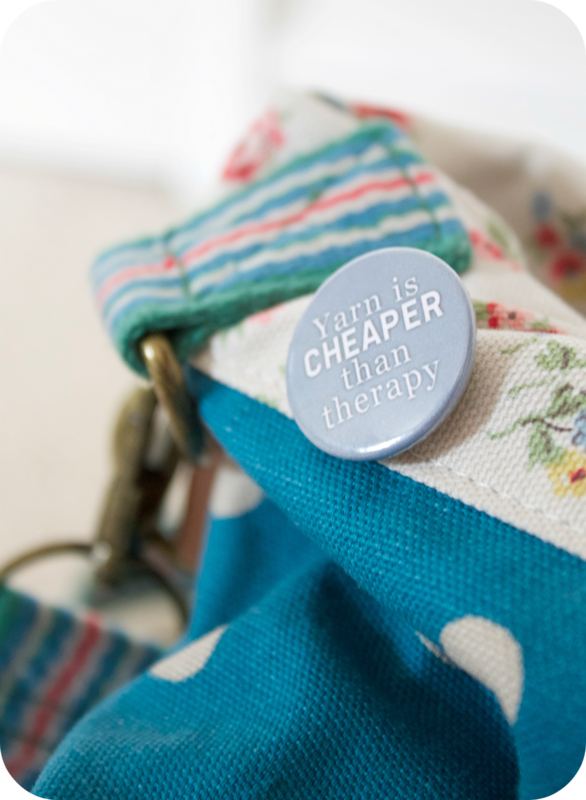 When the delightful Sandra from Cherry Heart asked me some time ago if I'd join the Blog Hop, I thought "why not?" Now that I am actually sitting down in front of my laptop, I've gone a little blank. You see, we've had a tottering time with relatives over the last couple of weeks or so. I'm not going to go into detail because I'm sure you have your own troubles but, honestly, it's been one thing after another and I'm worn out. Sorry to sound a bit downbeat and like I'm making excuses but, hey, I guess we can't all be sparkly all of the time can we? Anyway, back to the Blog Hop. I was extremely flattered to be tagged by Sandra. I admire her hugely and her blog is genuinely one of my all time favourites. It's not just her wonderful crochet creations (I've told her to insure those magic hands of hers) but her self discipline and generosity of spirit too. She is one of the most prolific bloggers in Blogland and yet I can't think of one single occasion when she hasn't made time to respond to an email or comment I've left on her blog. She puts a lot of us bloggers to shame *hangs head*. I've had quite a few new followers as a result of Sandra's kind words so, to each one of you, a big squeezy hug "hello" and a promise that I'm not always such a grumpalump! Waiting patiently in my 'works in progress' basket is my Spring Stripes blanket. I am also part way through making a cross stitch on single crochet cushion. What can I say? I absolutely love embellishing crochet with cross stitch and embroidery. However, (and I'm quite excited about this bit) I haven't been totally idle, I've been pretty busy starting to write my own patterns. Some are at the sketchy coloured pencil stage and have yet to be properly translated into crochet and some are at the prototype stage, needing just a few tweaks. I plan to release them towards the end of summer. I think they're very 'me' so they may or may not be your cup of tea but I'm super proud of them. Eep! This question gave me the dithers when I first read it. I'm finding it quite hard to say something that doesn't sound like I have delusions of grandeur. I think it's very hard to be different these days - almost everything has been done before. I suppose I like to think that I've adapted my craft to suit me. 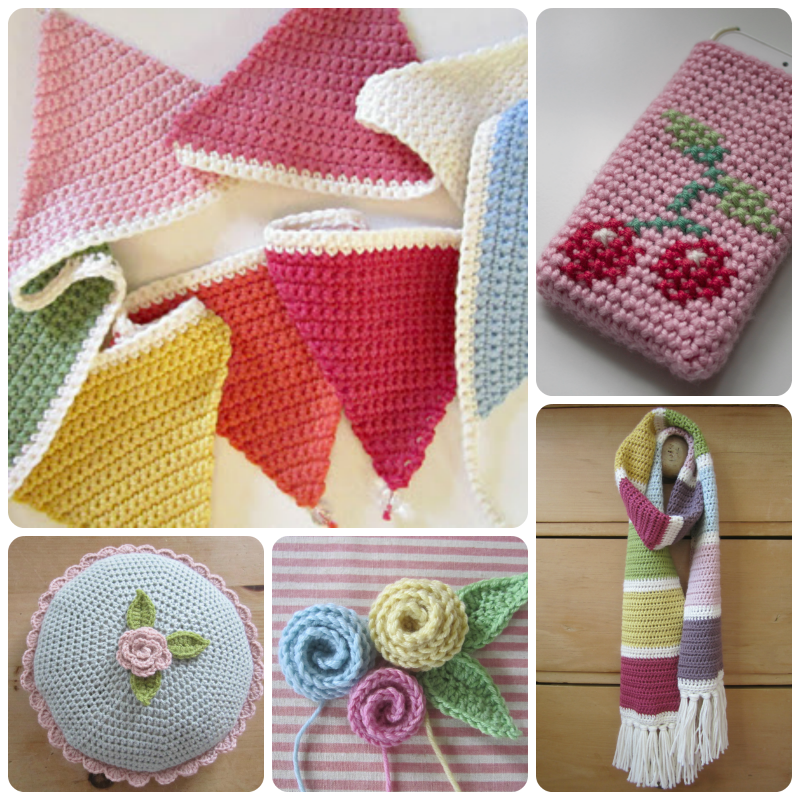 I rarely follow patterns; I crochet the things I visualise, the things I like. I learnt to crochet four years ago. This was my first creation. If I had to cite something that makes me ever so slightly different from the majority of others in my genre, I guess it would have to be the fact that I'm not a granny square crocheter. I'm not the biggest fan of holey crochet. Don't hate me! I much prefer the fluidity and neatness of a 'close knit' look. Does that make sense? If I've made a scarf and I wear it out shopping and a stranger compliments me on it, to say "I made it" is the best feeling ever! Priceless. I also get terribly inspired by you imaginative lot. Really I do. Sometimes I feel my head is about to burst with little bits of ideas, each gleaned from a picture here, or a description there. Sometimes I wish I was a little more structured in my writing process and style. I should love each post to take you on a cleverly written and thought-provoking journey but sadly I don't think that's my style. More often than not, I sit down in front of a blank screen and just type. There is rarely anything planned about the way I write blog posts. That said, I have to be in the mood. If I'm not, I simply cannot do it. I suppose I sort of imagine that you and I are having a cup of coffee and I just chat. Don't get me wrong, I'm not blasé - I do proof read each post afterwards - I am an unashamed perfectionist and a bit of a spelling and grammar fiend. Sometimes the pictures come first and I tailor what I write around them and sometimes, like today, the photos have to fit in with the words. As my love for photography continues to grow and grow, it's invariably the former. There! That's me. I do hope I have properly fulfilled my brief and not talked too much twaddle. Hello Heather, thank you for sharing your answers. when you said you weren't a fan of granny-squares and prefer crochet rows it hit me that yes, that is your style! I also know what you mean about having to be in the mood to blog, if I'm feeling down or stressed I would just moan the whole way through and make everyone else miserable, so I try to avoid it when I feel like that. Congratulations on your win from kate from the other winner of Kates giveaway. Aren't the gifts she sent lovely. I have already christened my cup and saucer and my bookmark has been in use already. I'm keeping everything else till a later date. I also love the colors you use in your work!!! Very ice creamy colors!!! "i made it..." is absolutely the most gratifying thing in the world!!! Have a great week!!! Hi Heather, I just wanted to say a quick 'hello' and to say I adore your blog! It is the first blog I really discovered and has remained my favourite for many years now! 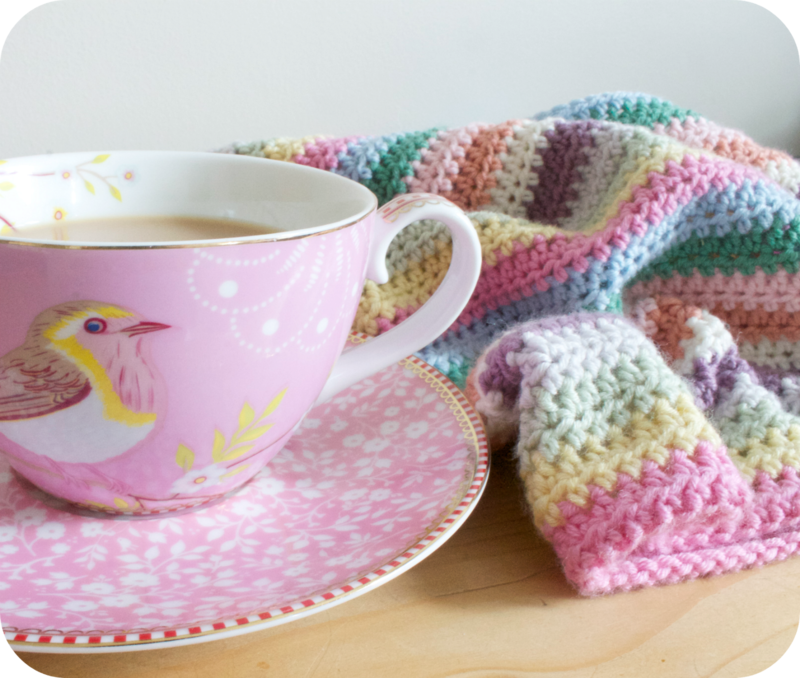 Love your use of colours and am always very excited by new patterns you kindly share! What a lovely post! 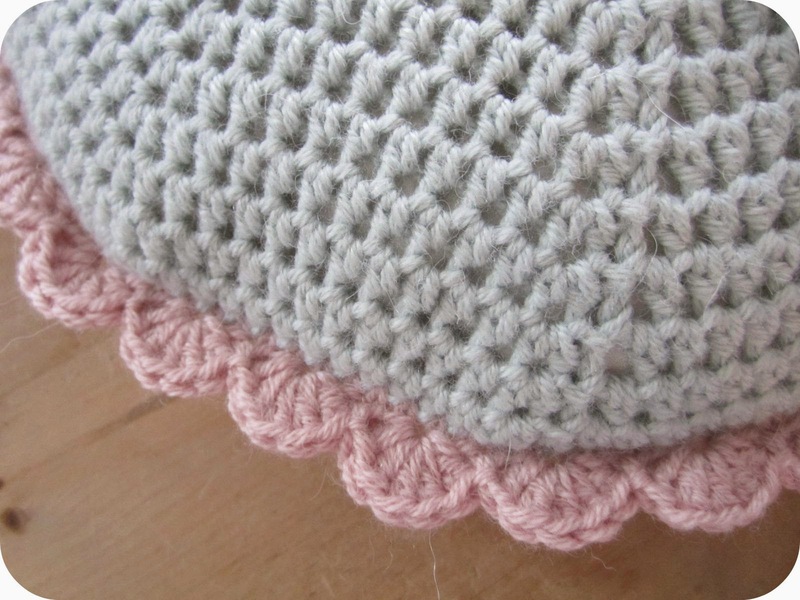 I loved reading about your thought processes behind what you make, and have always loved your distinctive style and how it has developed - the neat double crochet makes in beautiful sugar coated almond colours always look gorgeous. Exciting to hear you are pattern planning too - the pattern you shared the other day was beautifully clear so I'm sure they will be brilliant. I must confess to being like you in preferring the satisfyingly neat dc rather than the traditional granny squares, despite the huge variety there are, although I like to try all sorts. Thank you for linking to me Heather - I'm most chuffed! I'm not clear though whether you mean for us to do as you have done to keep the Blog Hop going? Perhaps you could let us know, as I'd hate to be the reason for it to grind to a halt cos we didnt carry it on! Hope all is more settled on the relatives front now - sounds a very stressful time. 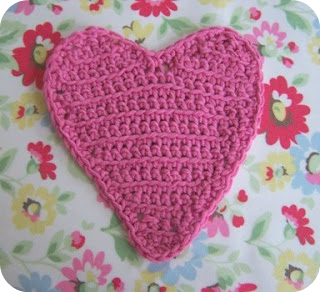 Have a good rest of the week, and make some time for a bit of therapeutic crochet! So sorry to hear you've been having family woes lately. They are never easy are they? But, I love your post and am very flattered by your absolutely lovely comments - you are always a sweetheart to me! 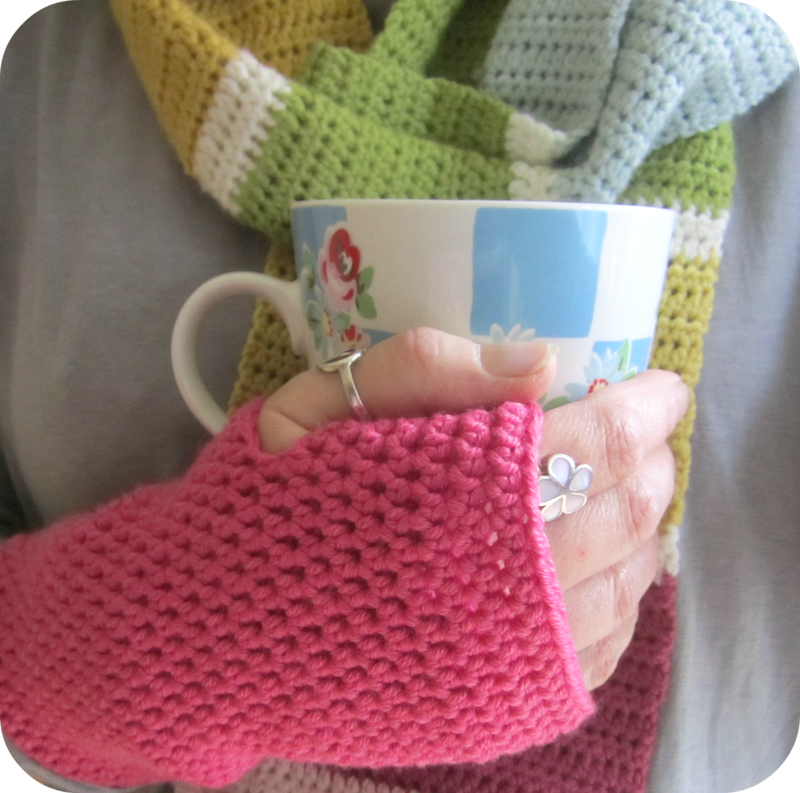 Anyway, I;d loved reading your thoughts on crochet and creating and I adore those little rose bud mitts, they are the cutest. 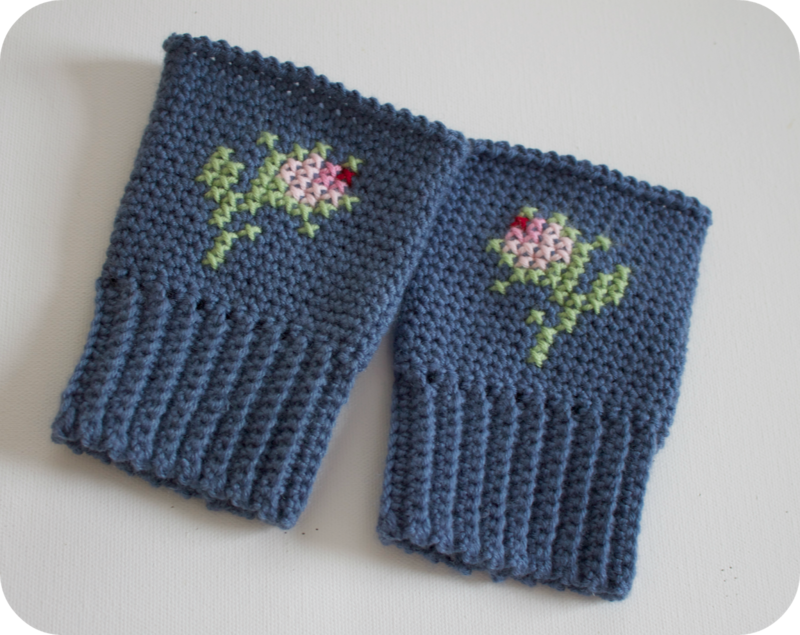 I'm also so excited to hear you'll be publishing your own patterns too - that's fantastic, I'll look forward to that! Interesting read. 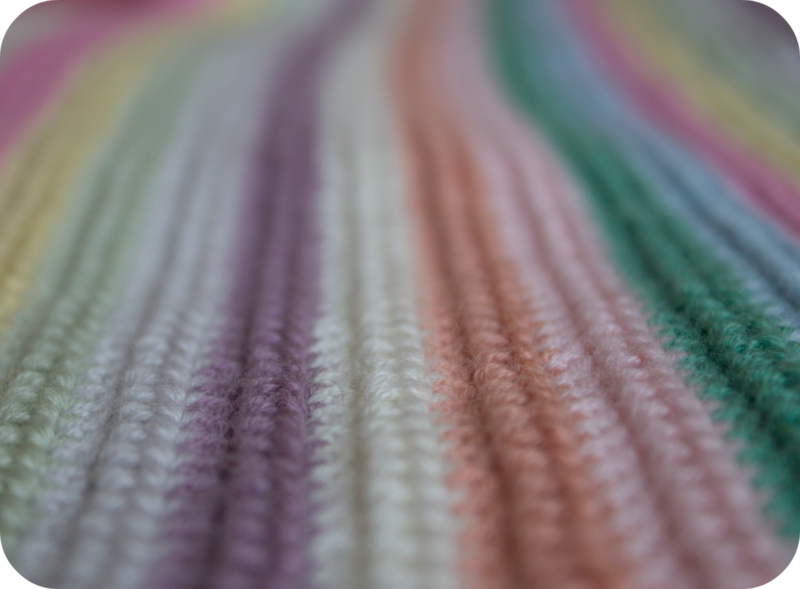 It is a tough question but I think your colours and the fact that you embellish your crochet makes you different. I find your colours lovely, relaxing and girlie without being twee. They are not colours I would normally choose but whenever I look at your creations I think 'I really want one of those'. And your photos are great. Enough to say I am a fan! A fabulous post as always lovely Heather! Patterns?! Ooooooh how very exciting and Ooooh I LOVE those little mits! Hi Heather, I really enjoyed this post...thank you! I really enjoyed finding out more about your crafting. I think you definitely do have a style and a gorgeous one at that! Your blog was one of the first I ever read, long before I started one of my own....you have been inspiring me for ages! Sorry you have some troubles going on, hope things improve soon. I am exactly the same, if I'm not in a good mood for any reason at all, I just don't want to blog. Thank you so much more mentioning my little blog, I am absolutely chuffed to bits! Hi there. I am looking at your archives and love your spring blanket. I have 2 questions.